All proceeds are used to provide independent living and community integration services. For those with disabilites who could not otherwise afford them, the copies are provided free of charge. Free copies: If you are a consumer of personal care services and unable to afford the cost you may obtain a free copy. Call (202)333-0262 or email us. Alternate formats: If you need an alternate format please contact us. 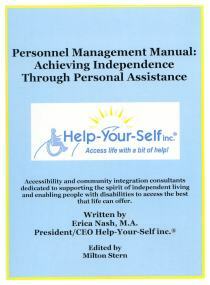 Help-Your-Self, Inc.® is a 501(c)(3) non-profit corporation. Contributions are welcome and are tax deductible.